Double L has been a leader in the advancement of poultry ventilation in chicken and turkey houses over the years. Achieving optimal performance from a broiler flock depends on executing ventilation as correctly and efficiently as possible. During minimum ventilation periods, producers are concerned about moisture, litter conditions, keeping birds warm, and air quality. The more control producers have over air quality, air temperature, and energy usage, the more control they will have over their paycheck at the end of the grow-out. Air entering through properly designed sidewall inlets (also known as vents) will allow the air jet to attach to the ceiling, travel along the ceiling until it makes it to the center of the house, and gently move down towards the floor. It is essential to maximize the travel distance along the ceiling so the cool incoming air will be sufficiently heated by the warm air collecting at the ceiling. The mixing of the cook, damp air with the warm air at the top of the house is great for air mixing, but the uniform temperature being created isn't automatically the greatest benefit to be reaped from this system. 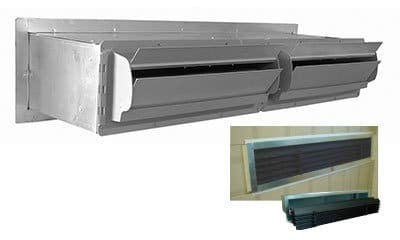 The sidewall poultry vents offered by Double L help to keep your air clean, lower your heating costs, and improve litter quality. As the poultry industry is evolving, house design and construction are evolving too. The basic principles for ideal air mixing become more difficult to achieve in the wider houses (larger than 60 ft. wide) without the correct equipment. The European Sidewall Vent from Double L has a curved blade that has the ideal design to achieve complete air mixing in houses. The curved blade helps direct more air across the ceiling and creates an efficient air jet that will reach the center of these wider houses with ease. 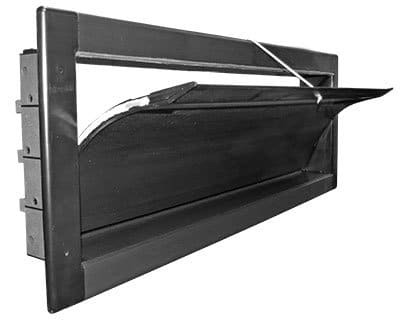 Double L's CSW4612 Ceiling Sidewall Inlet has a fully insulated, aerodynamic curved louver blade that directs fresh air along the ceiling to the ceiling peak for maximum air mixing. The fully insulated blade minimizes sweating in cold climates. All PVC construction is resistant to corrosion and bug infestations. Double L's DirectAire Wall Vents are "the Original European Curved Inlets". 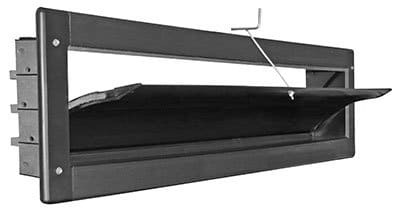 DirectAire European Curved Insulated Vents have an aerodynamic, curved louver blade that directs fresh air along poultry house ceiling to the peak for effective air mixing. The DirectAire's recessed design effectively pulls warm air from sidewalls 3 feet away and mixes warm air with fresh incoming air, mixing tempered air along ceiling to the peak of poultry house. The DirectAire Recessed Insulated Vents are available in four different sizes and styles: DirectAire 4413, DirectAire 4113, DirectAire 4408, and DirectAire 4108. 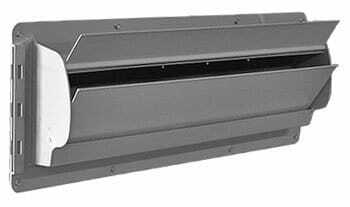 Actual Vent Size: 44" x 7.75"
Actual Vent Size: 41" x 7.75"
The patented TJP TopJet Gravity Wall Inlets are efficient counterweight vents with minimal expense used worldwide. Each vent blade opens from the top, directing air to the center peak of the house with no open ends or bottom leakage. TJP Inlets are available in three different size options: TJP1255 TopJet Gravity Wall Inlet, TJP2655LT TopJet Gravity Wall Inlet, and the TJP1355LT Gravity Wall Inlet. Two Inlets Framed Opening : 46" x 6.5"